There’s times in a career like mine when you can’t quite believe the opportunities you’ve been given – like interviewing royalty, going to a warzone, covering the Olympics. Or being a judge at one of the biggest competitions of the culinary year – the National Fish & Chip Awards. Before you even start thinking about it, no I didn’t spend a day eating fish and chips. This hard-fought title is no joke. The awards are months in the making. Entries are whittled down by endless visits, samples and scrutiny until only the best from each region remain. Those regional winners are then sent to London for a gruelling Dragons Den-style session in front of a panel who grill them about every single detail of their business, then decide who gets first, second and third place. By some stroke of serendipity, I found myself on that very panel, sitting among some of the biggest names in the fish and chip business, as well as previous winners of the coveted title, helping to decide on who would be declared Independent Takeaway Fish and Chip Shop of the Year. I’d have to write War and Peace to tell you everything about that day, and much of it was private to the judges, but I wrote a bit of a behind-the-scenes piece for Yahoo Style UK, so if you want an idea check it out here. In short, it was blimin hard and even we didn’t know who had won when we left that day. 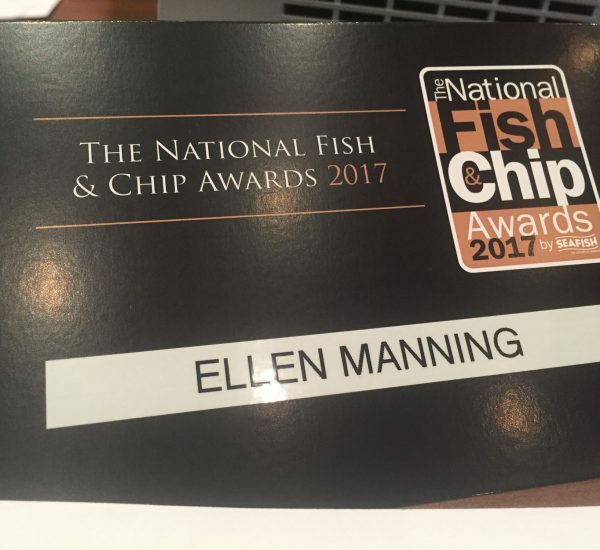 The next day, at a glitzy ceremony in London – basically the ‘Oscars’ of the fish and chip world – the winner was declared as Kingfisher Fish and Chips in Plympton, Plymouth. A huge moment for them scooping a title that, I’m told, would be a complete game-changer for owners Nikki Mutton and Craig Maw. For little old me (who couldn’t make it to the actual awards ceremony – gutted! ), it was a big moment too. While I love writing about food, I don’t profess to be a critic or an expert, just someone who appreciates and is passionate about food and loves talking about it, writing about it and learning about it. So to be asked to join a panel of judges for such a major awards and something that has such a huge effect on not only the industry, but the lives of individuals who enter it, is a real compliment and a bit of an honour really. Thanks fish and chips, you’ve made me a happy girl!